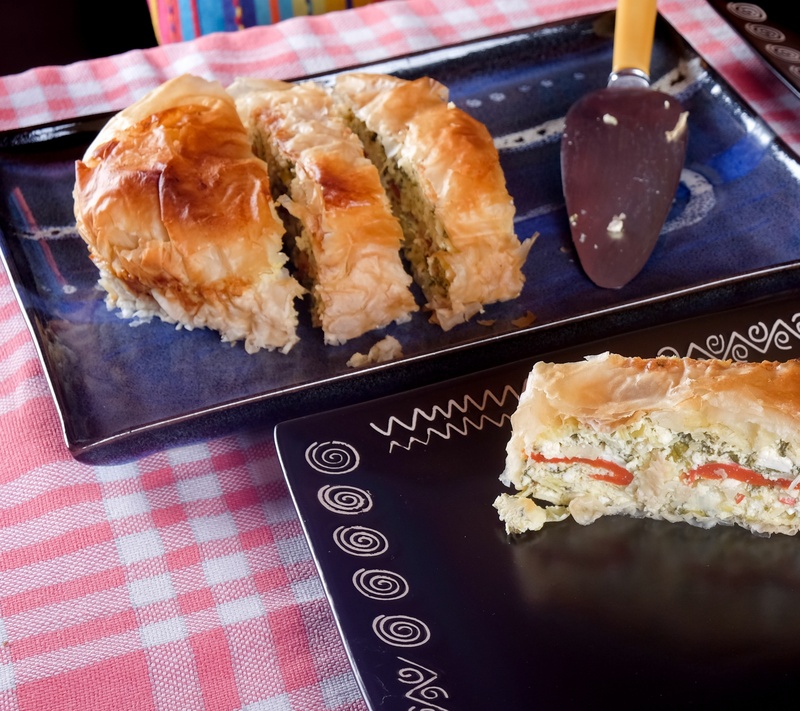 Leek, Spinach & Feta, Filo Wrap ~ as easy as pie! Light and fluffy, this easy pie is great as a side dish or filling enough to be the main star of the show! 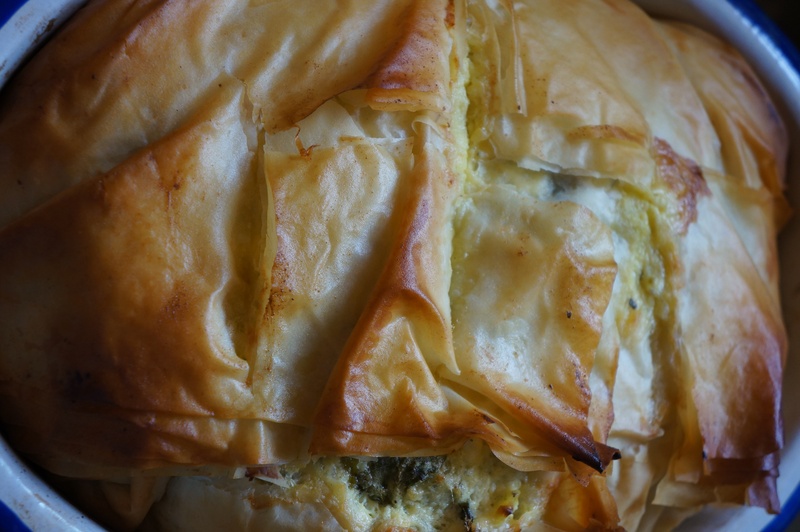 1 leek, sliced & washed; 2 table spoons olive oil; 100 gms spinach; 200 gms feta, drained; 125 gms greek yoghurt; 1 tea spoon dried oregano; 3 eggs, separated; 4 slices roasted red pepper; 50 gms butter, melted; 5 sheets ready rolled filo pastry. Pre-heat the oven to 190, gas mark 5. Grease and line a deep rectangle or oval baking dish. Heat the olive oil in a medium sized frying pan then add the leek and gently fry until softened. Turn off the heat and add the spinach to the same pan and stir through. Allow to cool. In a large bowl, mash the feta with a fork and add the yoghurt, rocket, oregano and 3 egg yolks. Add the leek & spinach mixture when it has cooled. Stir through. Add a pinch of salt to the egg whites and whisk to stiff white peaks (about 2 minutes). Gently fold into the feta mixture in batches. Brush each filo sheet with the melted butter and place all 5 sheets in the lined baking tin, leaving enough pastry over one edge to wrap over as a cover. Pour in half the feta mix. 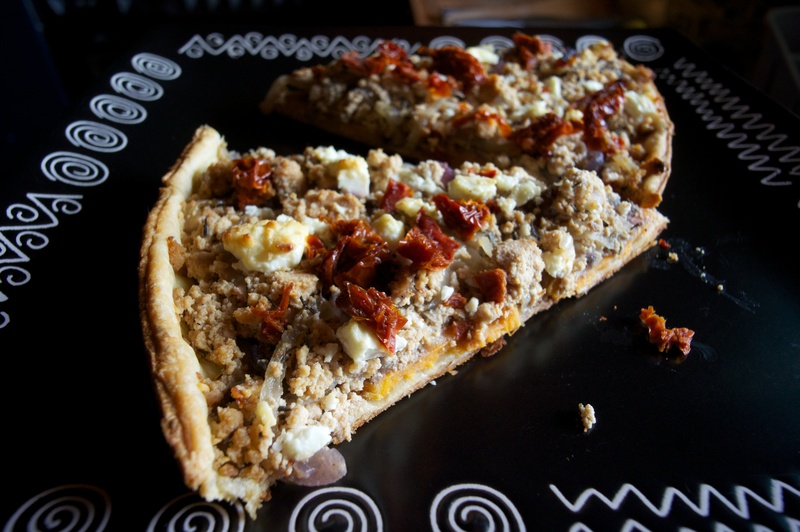 Arrange the slices of red pepper over, then pour in the remaining feta mix. 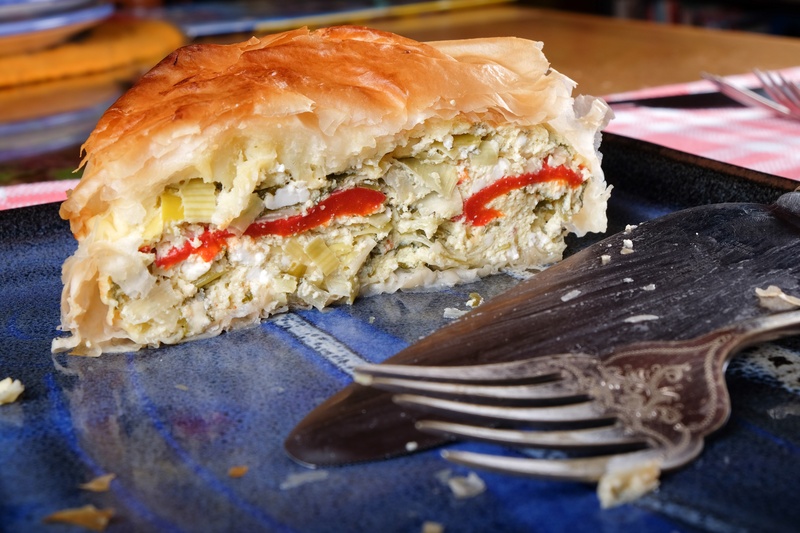 Wrap the excess filo over the top and tuck in the edges. Gently score the top and brush with any remaining melted butter. Bake for about 30 to 40 minutes until golden brown on top. 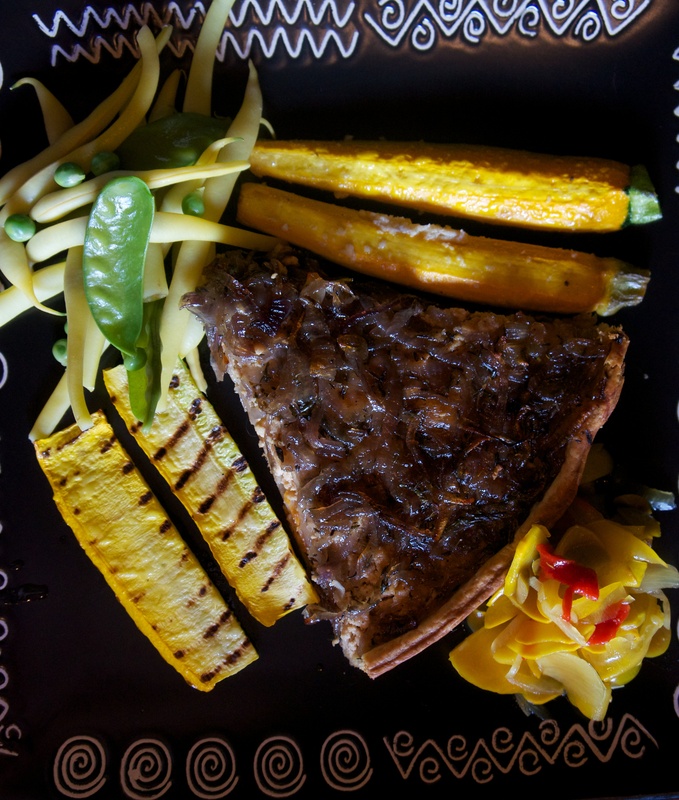 Allow to rest a few minutes before serving with oven roasted seasonal veg and a variety of slaws and salads. Great cold the next day too! Mushroom & Chickpea Loaf ~ simply sumptuous! I’ve been so busy this summer, with B&B guests, and Pamper Day clients as well as my usual massage clients that it’s been difficult to keep up with all the Monday’s that have passed between now and my last Meat Free Monday post! 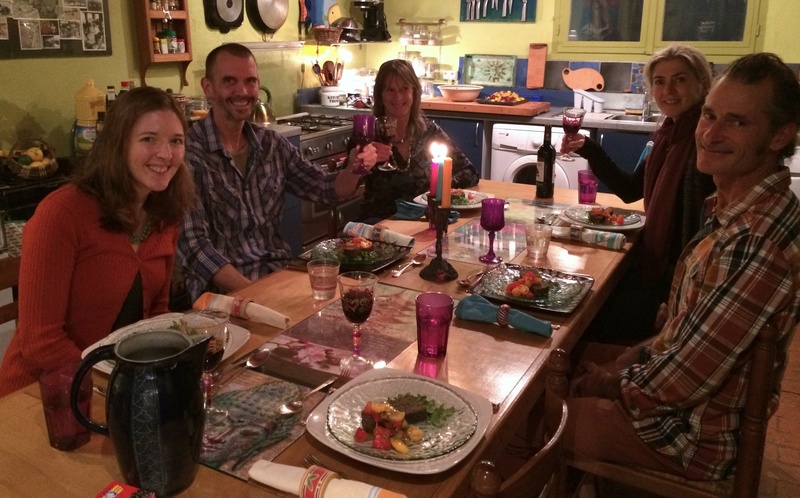 Even our guest for supper took this photo! As it begins to quieten down though, I hope I’ll have more time to test & post my recipes and to tempt you with some delicious photography! 500 gms button mushrooms; 400 gms cooked chickpeas, drained; 2 medium onions; 100 gms wholemeal breadcrumbs; 1 handful of pitted black olives; 1 handful of fresh spinach leaves; 1 handful fresh tarragon; heroic grind of black pepper. Pre-heat your oven to gas mark 4(180C). Loosely chop all ingredients, then blend together in a processor in batches. Spoon into a greased and lined loaf tin, smooth the top and bake for 30 to 40 minutes. That’s it! How easy is that? Serve with a tomato salsa, crusty bread and some good friends! This stir fry is an eclectic mix of subtle flavours and textures to tantalize the taste buds! Hot ginger is contrasted with cool cucumber & refreshing lemon. Soft tofu is contrasted with crunchy cashew while the coconut & coriander bring it all together to create an easy Thai style dinner! Did you know..? Peas contain many of the B group vitamins and are the richest food source of vitamin B1~ also known as Thiamin ~ essential for normal heart, muscle & nerve cell function. They are Power Packed with loads of other vitamins such as C, A and K and folate. They are an excellent source of iron, and have considerable amounts of zinc, manganese, calcium, potassium and magnesium. They contain as much protein & energy as meat and are one of the best sources of soluble fibre. 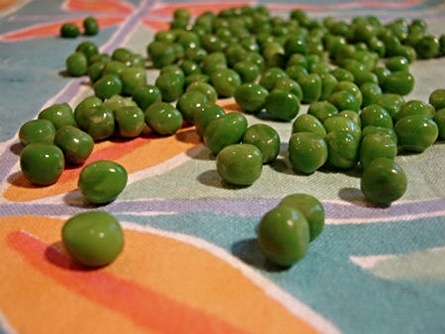 Frozen peas retain a high level of their nutrients, making peas one of the most popular and versatile foods! Make more use of Peas Please! Put all the ingredients for the marinade in a bowl and leave to stand for a couple of hours. Heat the oil in a large saucepan then add the onion & chilli. Fry for 5 minutes over a moderate heat. Add the fennel and after 2 minutes the cabbage and cashews. Continue frying for 2 minutes. Add the marinade mix, along with all the juices and the frozen peas. Pour in the coconut milk & coriander, stir, then simmer gently to heat through. Turn off the heat to let the stir fry rest, then serve with noodles or steamed rice. Try using any green veg seasonally available ~ spinach, broccoli, curly kale, Brussels sprouts. TURMERIC ~ Nature’s Natural Wonder! Turmeric is one of Nature’s most powerful healers. It’s an anti-inflammatory, antiseptic, antibacterial, and antioxidant. It’s a liver detoxifier, and a pain killer. It’s used in the treatment of depression, Alzheimer’s, certain cancers, digestive disorders & helps metabolise fat. Get cooking with it! Add a teaspoon to the cooking water in rice, pasta or other veg dishes. We’re harvesting a steady supply of deliciously long aubergines at the moment, so here’s a dish that makes great use of them. Pre-prep: Mix the turmeric with the salt in a large bowl, then toss in the slices of aubergine and stir to coat each slice. Heat the oil in a large frying pan, and when hot, drop in as many aubergine slices as will fit in the pan and fry gently on both sides until golden brown. Lift out and set aside. Continue frying all the aubergine slices in this way, using more oil as necessary with each batch. Allow to cool. For the rest, gently heat remaining oil in a large saucepan. Add the fenugreek seeds and after 2 mins, add the chopped onions and fresh chilli and stir well. Mix the curry powder, garam masala and corn flour together and bring to a paste using a little cold water. Add the lime pickle if using and mix well. Pour this over the onions and chilli and stir quickly to get a smooth thick paste. Add the tomatoes and coconut milk and continue mixing well. Allow to gently bubble for a minute then add the chickpeas, the prepared aubergines and finally, the torn spinach leaves and coriander. 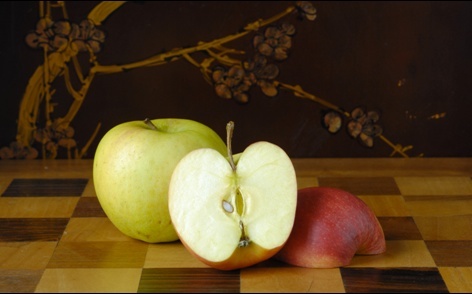 APPLES~ Packed with health boosting properties. Most of the goodness is in the skin however, so wash well & keep it on! Add one to your soups for undetectable delectable goodness! 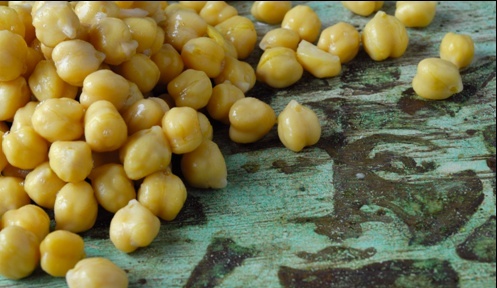 CHICKPEAS~ Contain high levels of protein & are easily digestible. 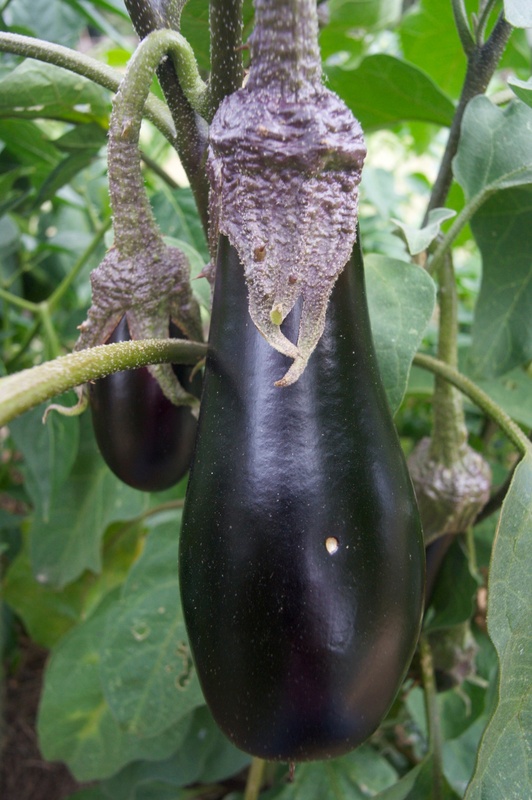 They’re a very good source of folate, manganese & copper, and low in sodium & saturated fat. 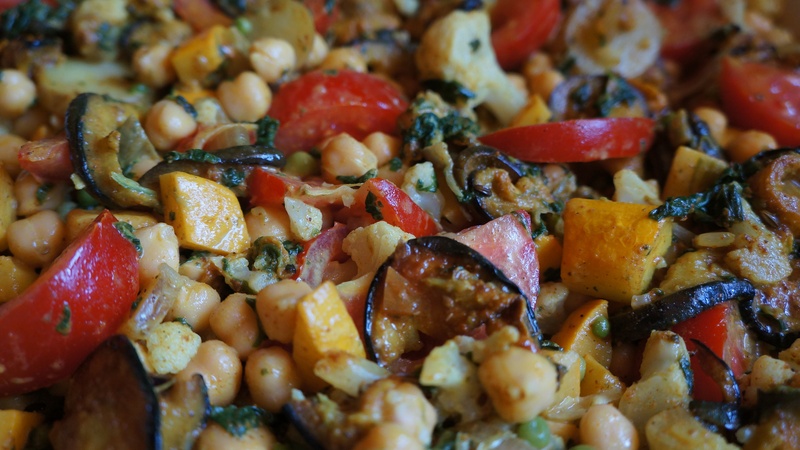 Get chic with chickpeas and include them in your diet! 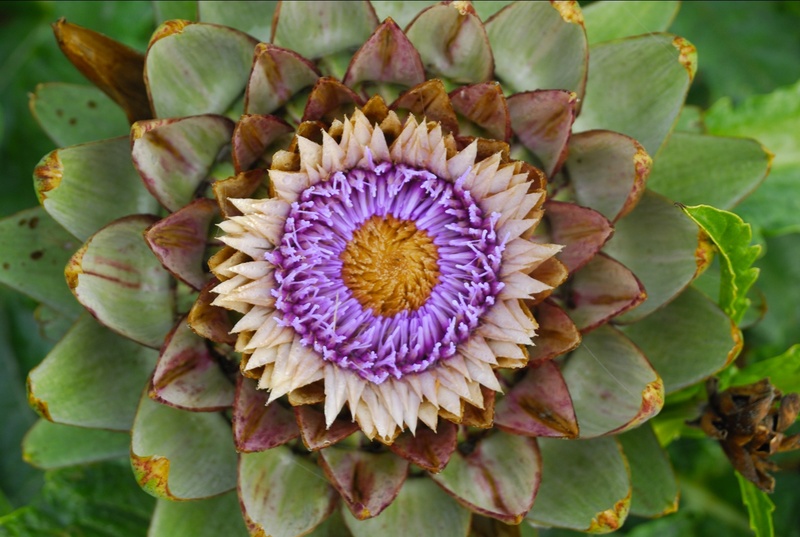 GLOBE ARTICHOKE ~ Aids digestion & assists liver function. Steam or boil fresh globe heads for 30 to 40 mins. 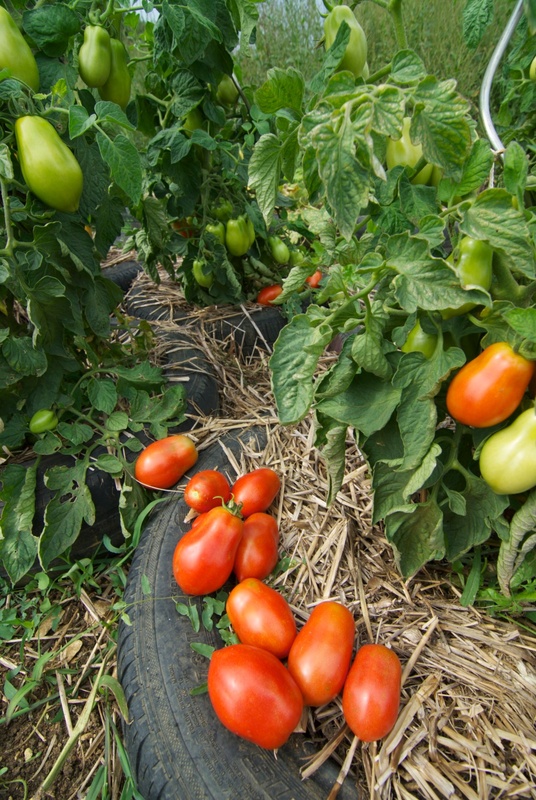 Pick off one leaf at a time, dip in a piquant sauce & drag the flesh off with your teeth! Very primitive & great fun! Also makes a fab center piece table decoration! 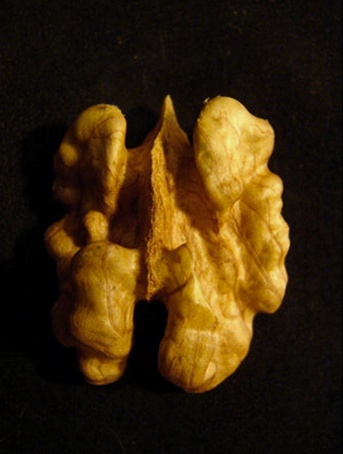 WALNUTS ~ Walnuts have long been associated with ‘brain food’ not only because of their 2 hemispheres & wrinkled appearance, but because of their high concentration of Omega-3 fatty acids. These are fluid & flexible structural fats found in walnuts, flaxseed and cold water fish which maximize the brain cells’ ability to usher in nutrients and eliminate waste. As well as flaxseeds, they are the best vegetarian source of Omega-3 fatty acids. 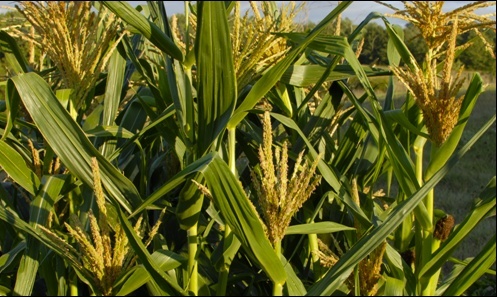 SWEET CORN~ Provides more starch & calories than most vegetables. A good food for steady blood sugar levels. Scrumptiously sensational straight from the cob! Drain all the Salad Ingredients well. Char-grill the artichokes then allow to cool. Gently toast the walnuts and allow to cool. In a small bowl mix together all the Dressing Ingredients. This one’s too easy to resist! And it’s just what we need in this still-chilly weather! Whoever is doing the rain dances, could they please stop! Heat the butter in a frypan over a medium heat and fry the onion until it becomes soft and translucent. Preheat oven to 200°C. Lightly grease an 18cm x 7cm springform tin and press an overlapping layer of potato slices around sides. Next, create a layer of concentric rings of overlapping discs to cover base. Spread a little onion and cheese across the base, season with sea salt and ground black pepper, then dot with 4 sage leaves. Cover this layer with potato, and continue alternating potato and cheese, onion and sage layers until you reach the top of the springform tin. Brush pie with butter, place on a baking tray, and loosely cover with foil. 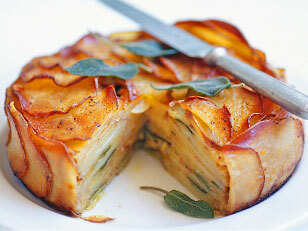 Bake for 1½ hours, then remove foil and bake for 30 minutes or until the potato is crisp. Remove and allow to cool a little. Cut into generous slices and serve with a green salad and chunk of your favorite bread! Sadly, tofu gets a lot of bad press, which is a shame because it’s a very worthy ingredient. It’s packed full of nutrients and is the richest non-dairy source of calcium. It’s high in iron & potassium, and contains omega-3 fatty acids which may help to lower blood cholesterol. Get munching Girls! 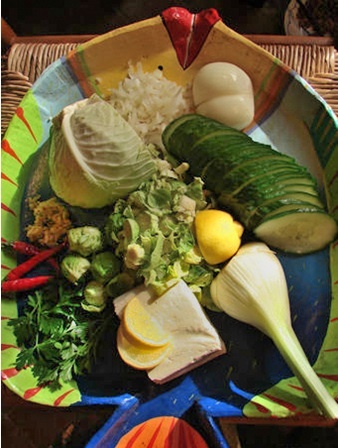 Tofu may also ease menopausal systems since it has lots of weak oestrogen-like compounds. Evidence suggests that it has some anti-breast cancer activity for the same reason. What type of Tofu? Always have the right kind of tofu for your recipe ~ firm or silken. Firm tofu can be cubed, crumbled, sliced or smoked. It can be marinated, sautéed, scrambled, kebabed or grilled. Pat it dry and do what you like! Silken tofu is much softer so it is often used blended with other ingredients to make dressings or cakes. And it’s widely available without being genetically modified! Check it out! Part boil the potatoes (about 5 minutes) then drain & set aside to cool. On a flat surface, pat the tofu dry with kitchen towel then crumble roughly with a fork. Tip into a bowl and toss with the chilli sauce. Allow to marinade while the potatoes are cooking. 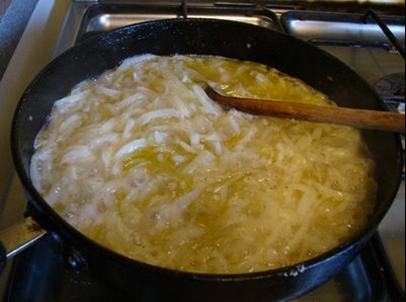 Melt the butter in a large saucepan, add the sliced onions and season well with S & P. Gently fry with the lid on for 5 mins. When they are soft and transparent, add the sugar & stir. Simmer gently with the lid on for 10 minutes. Heat the oven to 180C / gas 4. Roll out the pastry into a greased flan dish. Line the pastry first with the sliced potatoes, then tip in the tofu mix. Using a slotted spoon, spoon the onion mix on top of the tofu. Arrange the sliced goat’s cheese on top (if using) covering the whole of the tart, then randomly sprinkle over the sun dried tomatoes (if using). Bake for about 30 minutes, or until the pastry is cooked. Leave to cool to allow the tart to set, but serve warm.